Today's recipe from Lucindaville is one Harry Lowe calls a "planned over." A "leftover" is something you make or eat because it happens to be in fridge. A "planned over" is a dish you intended to make from the remaining portion of a dish you made earlier. Over at Cookbook of the Day, we gave you a recipe from M.F. K. Fisher for a cauliflower casserole. I adore making this casserole, it is one of my ultimate comfort foods. Since I often cook for myself, facing cauliflower casserole for several days is daunting. When I cook this casserole, it is usually with this planned over in mind. This recipe comes together in the time it takes to cook the pasta. I like a heavy pasta for this dish. My favorite is bucatini, a thick Italian spaghetti with a hole in the center, hence the name: buco means hole in Italian. I was never sure how they get that slim hole through the center of the spaghetti, but it's pretty cool. Use the amount of pasta you need. Bucattin tends to be sold in 2 pound bags so use less than that. This recipe works great with seafood: shrimp, lobster, or crab. If you keep a bag of frozen shrimp in the freezer (and you should), this is the easiest solution. You can also serve the ragout plain over pasta with some freshly ground pepper and a shaving of Parmesan. Cook the bucatini in several quarts of boiling salted water, about nine minutes. In a skillet over moderate heat, melt the butter and saute your seafood till it pinks up, or simply heat it through if it pre-cooked. Take the leftover cauliflower and mash it with a potato masher of just a fork, till the cauliflower is broken down but not liquefied. Add the leftover cauliflower to the skillet with the seafood and heat thoroughly. If the ragout is too thick, add a bit of water or milk. I like this recipe so much that for Christmas, I made it for company. 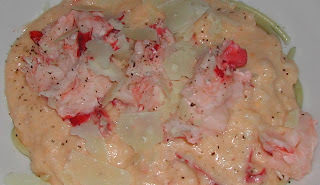 I cooked the casserole, steamed lobster and made the dish with a lot of planning but no "over." It was a big hit.